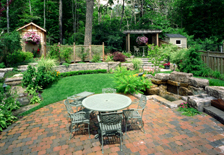 Bring us your magazine clippings, sketches and thoughts, and we’ll design a plan to bring your ideas to life and make your yard grow beautifully with interest for every season. Working with a highly skilled landscape architect, we offer careful site analysis, conceptual planning, and creative solutions for bed and shrub placement and hardscape design. Once the plans are finished to your satisfaction, our Installations services will put the plan into action.